A crack had opened directly under our sleeping-bags, and in its black depths we could hear the waters rushing and seething. Running out of the tent into the darkness, one of us stepped into an opening, wetting his foot, and no sooner had he withdrawn his leg than the crack closed like a vise, and with such force that the edges of the blocks were ground to fragments and the debris was pushed up into a quivering ridge. Ten feet away Jay a dog with his head cut clean off by a similar opening and closing of the ice upon which he had been sleeping. How the animal had managed to get caught in the trap we could not imagine; but there he was, as neatly beheaded as if an executioner had done the job. The remaining dogs were howling dolefully. Some of our sledges, with their precious stores, were already top­pling into the waters where the ice had up­heaved underneath them. Under our feet and all around us the ice was shaking and breaking - here pushing up, there sinking down - and the violently agitated sea was spouting through the openings. We were caught in an ice-quake. For a few moments, oddly enough, we did not fully realize our danger. To none of us was an ice-pressure a new thing and famil­iarity had doubtless bred in us, if not con­tempt for the ice-king, certainly a somewhat superfluous confidence in ourselves. But when, a few moments later, the very pieces of ice upon which we stood reared up and assumed angles of from thirty to forty-five degrees; when our entire camp started re­volving as if it were in a maelstrom; when we saw our tent, sleeping-bags, and cooking-kit threatened with destruction by a rushing mass of sludge and water, we knew that whatever was to be done must be done right quickly. There was no panic. There was not the slightest sign that any one of us was even excited. We cut the harnesses of such dogs as we could get at, that they might save themselves. In the very nick of time three of us sprang out upon the floe which held the tent, tilted though it was with one edge down in the boiling sea and the other up in the air; and after a sharp struggle, we suc­ceeded in rescuing the precious sleeping-bags, the cooking-outfit, and the tent itself. Obviously it was imperative that we run away from this convulsed spot as quickly as possible. But whither should we go? In the darkness and storm it was impossible to see anything around us but the shaking, quaking ice-blocks. I asked Paul and Emil to go hunt a sound floe, if such a thing re­mained in the Arctic seas, upon which we could take refuge. They instantly set out, scrambling over the rolling, shaking slabs, and as they disappeared in the gloom I said to myself; "Well, that's the last I shall ever see of those boys." Yet I was not much concerned about it. For some reason, which I never expect to understand, I was unable to get up more than a sort of indif­ferent interest in what was going on. The most acute sensation I had was in a thought of how much more pleasant it would be back in the snug bag, and whether it was really worthwhile to stay out in this bitter wind trying to save things. In a few moments Paul and Emil returned with word that twenty or thirty rods away they had found a floe which appeared to be sound and safe. Then, for the first time, we all began to feel as if there was some­thing worth hurrying for. Laying hold of a sledge, we hastened with it over the quak­ing pieces and across a chasm in which the water was running like a mill-race, to a place of safety upon the large floe beyond. Three trips there and back we made, each time finding the chasm considerably wider than before. 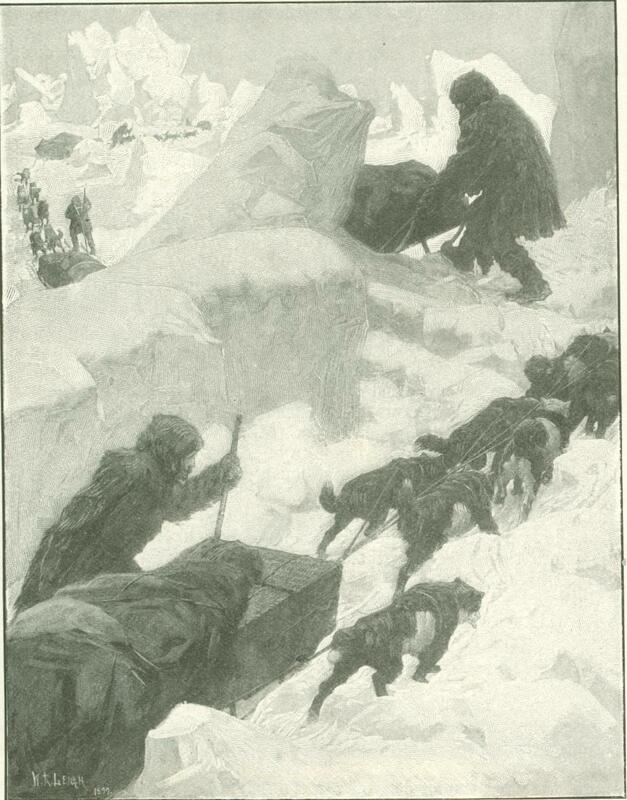 It was all we could do to get the third sledge over, and when we attempted to return for the fourth there was before us a river - a mad-rushing, ice-strewn current. The spot where our camp had stood, and where but a few moments before we had all been at the work of rescue, was in a volcanic state of eruption. Masses of ice were gush­ing up into the air like flames. The brittle blocks were crushing, grinding, snarling, bit­ing at one another. The sea was rushing wildly through and over the debris. From within this swirling maelstrom of ice and water came the doleful howling of a number of dogs whose fastenings we had been unable to cut. We stood at the margin of the up­heaval and listened. The volume of cry from the dogs became fainter and fainter. Soon it dwindled to the moan of a single dog. A second more, and there was no sound to be heard save the cracking, crunching of the ice, the swishing, hissing of the waters. As I stood there in the storm by the wreck of a great hope I noticed how strangely like the roar of a fierce conflagration were the mutterings of this polar paroxysm. Without a word we turned back to our res­cued sledges, moved them farther on, and, as soon as we felt quite secure, stopped and put up the tent, to escape the force of the wind. While cook was preparing coffee and oatmeal we made an inventory of our losses. One-third of our dogs and all of our dog-food were missing; also 300 or 400 pounds of bacon and condensed food; bags of reserve clothing and footwear; all our ski and our canvas canoe; and, worst of all, our basket of instruments. The Polar dash was at an end. It would be almost like suicide to go on. When the light returned and the storm had abated, we walked back to the place where our camp had been. A strange scene lay before us. Where our tent had been pitched there were now masses of pressed-up ice, rising in places thirty feet above the level of the sea. The solid crystal sheet, from eight to fifteen feet in thickness, had been shattered into a million fragments, turned bottom up, block packed on block; and in between the elevations were pockets of debris - the powdered, pulverized detritus produced by these titanic forces. Now all was still and calm, and where the sea had rushed up and formed little pools in the sludge, new ice was forming in the thirty-degrees below ­zero temperature, and all was shining bril­liantly in the morning sun. Not a trace of sledge, or dog, or canoe, or ski, or anything whatsoever that had been ours, was to be seen in the wreck. Had the strongest ship that was ever built been caught in this con­vulsion, it would have been ground into kindling wood and the kindling wood into powder. Now we could plainly see the cause of the disaster, hitherto inexplicable. We had pitched our camp about half a mile from an enormous iceberg, fragment of a glacier that had drifted here perhaps years before and grounded. It was about as big as a mod­ern New York or Chicago "sky-scraper," ris­ing forty feet above the surface of the water, with its feet upon the earth perhaps 150 feet below. There it stood, like a mountain, now only a hundred yards away. The storm that blew up while we slept had started the whole field of ice into motion. It had driven the ice down upon the great berg just as the sawyer moves his board against the saw, or as you may push a piece of cardboard against a fixed knife. And our camp had been right in the line of the cut! It was all plain enough. The mountainous berg had sawed the ice-sheet, and into the channel thus formed - here, as elsewhere, nature will have no vacuum - the pressure of billions of tons, coming from rear, right, left, had jammed, rolled, revolved, uplifted, down-thrust, crunched, crushed, powdered the fragments of floes in a death struggle for mere place to exist. All along that coast, as far as we could see this bright morning, the one spot—the one little rood out of all these millions of acres - where our camp could have been pitched only to be destroyed was the very spot where it had been pitched. All other spots for miles and miles were just as they had been. Start an ant crawling across a newspaper. Take a pair of shears, shut your eyes, make one random clip, and cut the insect in two. We were the ant creeping across the surface of this great ice-sheet, and that is what chance did for us - the one out of millions that saved at least one human life. It is only by sledging that any one now proposes to reach the North Pole. The old idea of an open polar sea and the navigation of the very top of our earth in a ship is aban­doned. After Andree's disastrous attempt to find a royal aeronautic road to the Pole, no one else is likely to try that method. The plan of all modern Pole-seekers is to get as far north as possible with a ship, establish headquarters upon the land, and thence make a dash for the Pole and back again with dog-sledges. 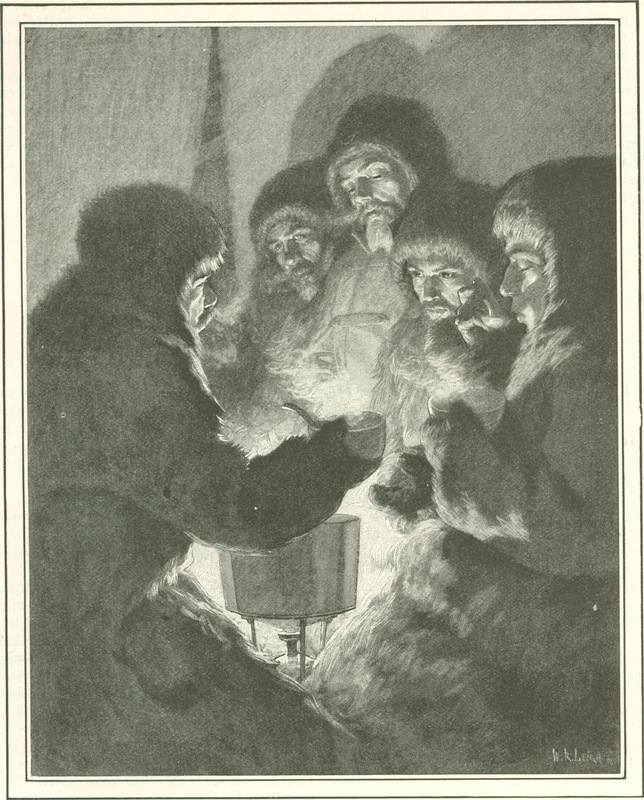 Nansen varied this plan by leaving his ship when she had drifted farther north than man had ever been before, within 415 statute miles of the Pole; and if he had had a supply depot in north Franz Josef Land to return to, so that he could prudently have remained longer in. the field, he might have made the ninetieth degree. To march from an outpost in any of those far northern lands to the Pole and back is a very large order; but there are men of ex­perience who still think it can be done. How difficult the task is only those who have ac­tually attempted it can know. The popular idea is that the feat may be performed if one will only give enough time to it; that he should push one depot of supplies out beyond another, advancing step by step, through a chain of such stations, till the Pole be reached. This would all be very well if we had the land to work upon. If we had land running to the Pole from lower latitudes, say the eightieth parallel, attainment of that objective of, man's adventurous ambitions would be a simple matter. But we haven't. So far as we know, there remains between the most northerly land and the Pole about 500 miles of sea. It is possible to travel over the ice which covers this sea, rough and shifting as it is; but it is useless to establish depots there, for the odds are a hundred to one they can never be found again. 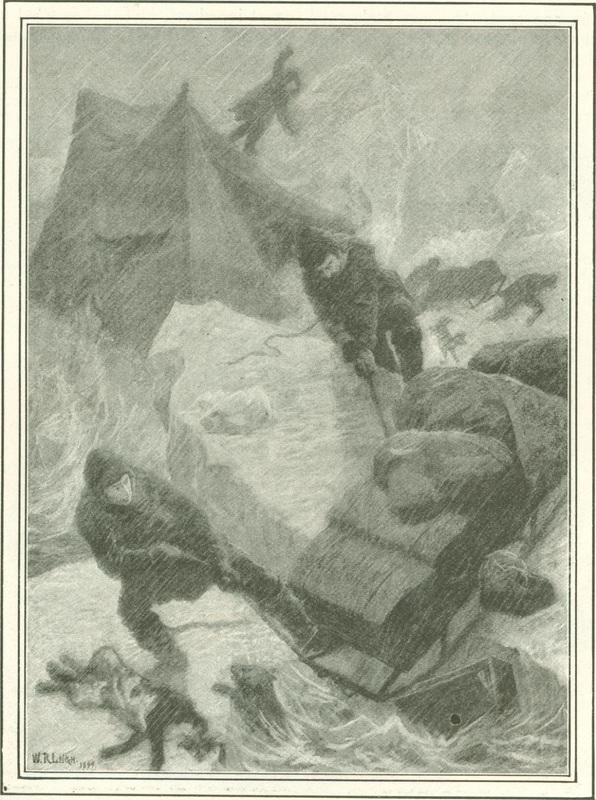 Return­ing from his attempt to reach the Pole, Dr. Nansen made no effort to find the "Fram," because she was drifting to and fro, though at no time could she have been more than 150 miles from him, and the probabilities are that on his southern journey he passed within thirty or forty miles of her. The season of the year during which one can travel over the ice-sheet is limited. The winter months are too dark, and the summer months - oddly enough - are too warm. The best season is from about the 1st of March to the end of May - say a hundred days in all. Before March, the sun is far below the horizon and the gloom too dense. After May, the snow is too soft and sticky, and the ice too much broken up. It is true that some traveling might be done in October and early November, after the snow has hardened again, and this suggests the plan of using the 100 days of spring for reaching the Pole, and the autumn for returning to headquar­ters. But it must be remembered that, after once leaving the land and taking to the sea-ice, no game can be had; everything the travelers eat, and the fuel for melting ice and cooking food, must be carried with them. The more they carry the slower they must travel. Two pounds a day is the minimum ration per man, of the most approved modern "condensed" food. This means 200 pounds per man for a journey of 100 days, to say nothing of weight of sledges, instruments, tent, fuel, sleeping-bags, and pack­ing. With the help of dogs this much may be carried, and the period of absence from land may be extended to 125 or even 140 days, though at first the loads will be very heavy. If, however, a party sets out upon a journey of nine months' duration, nearly 600 pounds per man would represent the minimum load simply of food for men alone and excluding all other things, among them the sustenance of the dogs, clearly an im­possible burden. So there is nothing for it but a quick journey out from the land and back again. It makes no difference whether the base used be North Greenland, Franz Josef Land, or a ship that has drifted into the inner polar sea - it is necessarily "a dash for the Pole," and nothing but a dash. It is, practically, a campaign of 100 or 115 days, beginning in the midst of the Arctic winter and ending at the commencing of summer. The man who can get his base established just right; who can so organize his party and so arrange his weights and his motive power as to be able to cover an average of ten miles a day, and who can manage to avert all serious acci­dents, has the Pole within his grasp. Ten miles a day, a mile an hour, seems very little. But try it once, if you want to know how difficult it is. Our party was as well organized as any party could be. We had the best of everything, and not too much of it. Simplicity is the first essential of a successful sledge trip. Yet work as hard as we could, we made an average of only six miles a day, about the same as Nansen and Johansen had made. Of course our loads were heaviest these days, for we were carry­ing four months' supplies. Each of the five of us had a sledge and a team of dogs. Much of the road was very rough. The previous fall, before the ice had frozen solidly, north­east winds, driving down against the land, had smashed the floes into a forest of hum­mocks and ridges. Between these elevations there were pockets of deep snow. Winding in and out, up and down, over and .through these obstacles, we made our painful way by dint of much lifting, shoving, pulling, and an incessant shouting at the poor dogs. Without dogs one can do nothing on a sledge trip. Reindeer have been suggested, but they are not equal to dogs in rough ice. Horses or ponies have been tried, but with indifferent results. On a smooth road they are, of course, superior to dogs, but amid hummocks and pockets they are of little avail. Besides, if we had a smooth road, the Pole would have been discovered long ago. One great advantage in the use of dogs is their ability to endure anything in the way of cold. Fifty below zero has no terrors for them. I remember one camp we made. It was in February, shortly after our start, and before the sun had risen. A storm came down upon us from off the gla­ciers of the near-by land. We were upon a level, snowless stretch of ice, and the wind fairly blew us off our feet. Only by bracing to leeward with a ski-stick could one stand at all. The dogs were determined to run with the wind, and it was almost more than we could do to keep them anywhere near the course. 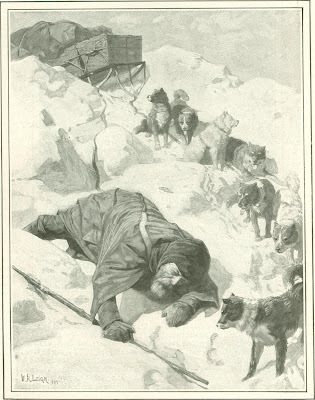 Much of the time we had to drag dogs, sledges, and all, with the icy wind blowing the breath out of our bodies. The storm increased in fury, and as it was absolutely impossible to camp on this smooth, bare ice, we looked eagerly for some hummocks or ridges where we might make the tent-pegs hold, or at least bury them in the snow so that they would not be blown miles away the moment we let go of them. At last we found some small hummocks, and stopped to make camp. Usually this is the most pleasant of tasks. One takes keen delight in preparing for the night, and heav­enly it seems to crawl in out of the wind, and to hear the lamp sing as it boils the coffee and the soup. But this was a most bitter camp-making. It seemed impossible to do any­thing. The air was so filled with snow that we could barely see one another. "Make the dogs snug first," I said, "or they'll perish." So we scooped out a sort of trench, and buried the dogs in the snow, and then tried to rig up some sort of shelter for ourselves. It was not easy. No tent could stand in that blast, and so we fastened down the ends of the canvas, crawled under, boiled some coffee, and spread the sleeping-bags. A few hours later the violence of the storm was moder­ated, and I looked out to see how things were coming on. There were the dogs, lying on top of the snow, as happy as they could be, though a stiff wind was still blowing and the temperature was about thirty-five degrees below zero. In trying to make these dogs comfortable I had frozen my nose and my cheeks, and some of the men had suffered similar trifling frost nips. So after this we permitted the dogs to hunt their own shel­ter. It was never too cold for them. Some­times on breaking camp in the morning we had to dig them out of snow-drifts ; but once a dog has shaken himself vigorously, straight­ened out his cramped legs, quarreled with one or two of his neighbors, and wagged his tail a few times at his master, he is ready for business. A Siberian dog will pull only a quarter as much as a man can pull, and he needs about a pound of food per day, or half as much as the man. But he requires no sleeping-bag or tent, no extra clothing and boots, no water has to be melted for him, he smokes no tobacco. Best of all, if he gets hurt, or be­comes ill or exhausted, you don't have to drag him on the sledge or turn back. You convert him into fresh meat for the sur­vivors. That is the economy of dog-sledging in these dashes for the Pole. Your four-legged comrade drags fifty or sixty pounds of load, and he carries twenty-five or thirty pounds of meat "on the hoof." But kill­ing these faithful fellows who have worked in harness by your side, who lick the hand that is about to smite them, and look up into the murderer's eyes with true dog trustful­ness, was the bitterest of all the bitter things we had to do. We killed only half a dozen, using a rifle, and did the job off a little way from camp, behind a hummock, in a sneak­ing sort of way, as if we were ashamed of it, as we were. Good boys, those dogs. I became very fond of my team, rogues though they were, some of them. Dogs name themselves, and mine bore the cognomens of "The Deacon," "The Dandy," "The Assassin" (the latter had killed only half a dozen of his brethren the previous winter), "The Lady," " The Fox," "The Judge," and "The Sport." "The Assassin" was the leader, and a noble draft dog he was. He pulled just like a mule. His only fault was that he wanted to be at the head of the whole procession all the time. If put behind another sledge, he would not "track," but cut cross-lots at every turn of the trail. He broke two sledges in this way in the rough ice, to say nothing of some of my good reso­lutions. I tried to discipline him by putting him back among the team; but he felt the di race, and wouldn't pull at all, so I had to make him leader again. With all their mean tricks, I loved these dogs. You see, I had to work right alongside them, with a harness over my shoulders. On good ice the dogs would pull the load, but whenever the sledge stuck in a rough place or a pocket of deep snow - and this was once in three or five minutes - I had to keep it going, or start it, if it stopped. The dogs would pull only when they felt motion behind them. They had a shy way, too, of watching me out of the corners of their eyes, and when the sledge dragged a little hard and they saw I was not pulling, they stopped short, as much as to say:" How do you expect to get along if you don't do your share of the pulling?" But I fooled them by pretending to be work­ing very hard when actually I was not mov­ing ten pounds. At every stop they got even with me by twisting themselves up into knots, tangling their trace lines in the most hopeless way, and then lying down to rest while I, with frost-nipped fingers and such patience as I could command, straightened things out. But there were compensations for all these annoyances in the fine way the beasts worked. It was not necessary to beat them, and whip­ping or beating was not allowed on this trip. It was wonderful what we could do with these dogs by talking cheerily to them. They didn't know what we said to them, but they were as keen to scent the tone in which we said it as they were to smell a bear or a seal. When we were blue and talked snap­pishly or petulantly to them, they became discouraged too, and didn't work half so well. Brace up and sing to them, and call them "old boy," and put a jolly ring in your voice, and they would pull their legs off for you. All but "The Fox" - he was a born shirker. He used to go lame all of a sudden, so that he couldn't pull; and at first I sympathized a good deal with him and called him pet names. Then I discovered that he was sham­ming and that a gentle touch with the end of my ski-stick served to cure his lameness in a jiffy. But the habit of going lame when he became tired he never got over, and for months he tried two or three times a day to deceive us, always with the same result. Of course we had our fair share of suffer­ing on this sledge journey. The cold is not the worst - that is, directly: so far as ac­tually feeling cold was concerned, we had no trouble, and a few frost-bites didn't count. Hardest to endure was the indirect effect of the cold, coupled with the absence of a fire to dry things. The camping hour arrives. You have been working hard all day, pulling and tug­ging, in a temperature ranging from twenty-five to forty-five degrees below zero, and perhaps with a nice cool wind blowing from the north. Outside you are a mass of frost, and inside your skin is wet with per­spiration. Be careful in pitching the tent that you do not leave your mittens off more than a few seconds, or you will not only freeze your fingers, but find the mittens frozen so hard you can't get them on again. The best way is to put them inside your jacket till you want them. When the tent is pitched, one man goes to cut fresh ice - ice, that is, at the top of the hummocks, fifteen or eighteen feet above the sea - and break it up fine for melting over the petroleum-gas lamp. This is the only way to get water, and it is not an easy way, for the ice is almost as hard as a rock. 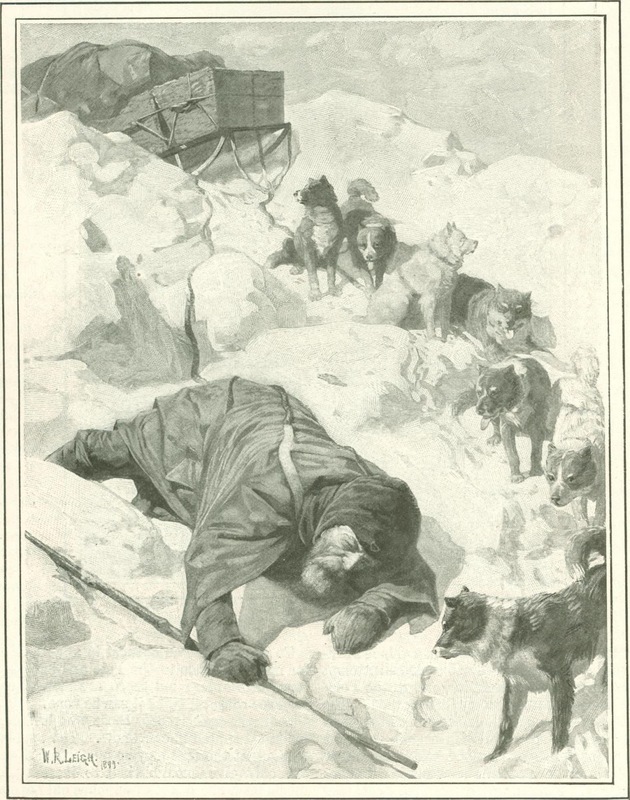 Another man feeds the hungry dogs their meager rations of frozen meat. Poor beasts, it is a small bit, and is swallowed at a single gulp, and then nothing more than snow for them to eat till the next night. It makes one very sad to see the hungry fellows sitting about watching with wide eyes their busy masters, and wagging their tails in expectancy of a crumb or two. But it is a hard life for both man and beast, and rations must be strictly adhered to, no matter how many good dogs go to sleep in the snow with empty stomachs. They'll jump into their work all right in the morning, just the same. Two men get the big sleeping-bag off the sledge and carry it into the tent. There they try to unroll it. Half an hour of tug­ging, yanking, pounding is needed to accom­plish this feat, so fast is it frozen from the moisture of the previous night's use. When it is spread flat in the snow, we begin getting in. Preliminary to this we beat and scrape some of the snow and frost off one another's clothing, but it is impossible to get it all off. The remainder goes into the bag with us. We don't take off any clothing, not even our moccasins or our hats. Yes, we do take off our rein-skin shoes, but it is only for the purpose of turning them inside out that they may the better dry during the night, and that we may take out the senne grass or hay which we have worn in them to absorb the moisture and keep the feet dry. The art of keeping warm feet is to keep dry feet, and three or four pairs of woolen stockings and a nicely packed bunch of this hay work to a charm. Whatever else we got in this excur­sion, we did not get cold feet. Scattered out to freeze, the hay can be shaken entirely free of frost next morning, and so will be fairly dry to put on again. But what a job it is to turn these frozen moccasins night and morning with our frost-nipped, tender fingers! More than once have I seen a big, brave fellow shedding tears and swearing together while at this job - it hurt so. We start kicking our way into the sleep­ing-bag. It is frosty, icy, hard in there, and it takes a lot of kicking and shoving to straighten it out and work our way well down in. By the time this is done supper is ready, and this brings in the only glorious hour of the day. Hot soup, hot coffee, bis­cuit, a piece of cheese; bacon, sometimes raw, sometimes boiled in the soup; oatmeal porridge; a nice chunk of butter, hard as a rock, but it tastes good in the coffee ; and a big drink of ice-water, when we are lucky enough to have any water left over. If there isn't any leftover we go thirsty, as we can't afford to use more oil. We sit up in the bag like birdlings in a nest, and eat this supper with voracious appetites and with mittens on our fingers. The steam is converted into frost, and the white particles fall all over us; but we don't mind that as long as there is anything to eat. The sad­dest moment is when everything is gone and the ration exhausted. Then a pipe for consolation - a pipe, and the pleasant task of writing up one's journal in a temperature of seventy degrees or more below freezing. There was once a time when I didn't believe it possible for a man to write two or three hundred words in half an hour in such cold, with bare hands; but now I know it can be done, and, what is more sur­prising, the man can actually read what he has written. The next thing is to push one's self all the way down into the now fairly well thawed-out sleeping-bag; pull up the flap and but­ton it tight, and get snuggled for the night. All this is easier said than done. The pre­dominant idea of comfort in a sleeping-bag prevailing among my Norwegian comrades was to slide down somewhere near the bottom and telescope themselves together; but I had always to have a smell of fresh air, no matter how cold it was. There were four of us in one bag, and none of us was small, and we had to lie "spoon-fashion." When one turned over, all had to turn. As we were packed in like Smyrna figs in a box, and as I occupied one edge of the bag, where the cover-lid was drawn down over me as tight as a drum-head, it sometimes took me a quar­ter of an hour to turn over. It was quite an athletic feat, but it had its advantage in that it helped one to warm up. The effort to turn about-face usually started perspira­tion, though the jacket I wore was so stiff with frost that on first getting into bed it was difficult to bend the arms. We always wore our mittens in bed, at least during the first part of the night, when we were strug­gling to get our blankets straightened out. These were like pieces of sheet-metal to start with; but the heat of our bodies and the persistent bending and breaking of them finally licked them into shape. Surprising, this body heat of a vigorous man! In the course of a couple of hours it thawed most of our clothing into wet compresses, made the blankets limp and soggy, and even softened parts of the sleeping-bag itself. Something like a hundred minutes after buttoning the flaps down over our heads we found ourselves lying with pools of water under our bodies, while frost still adhered to our trousers. By this time two or three of my Norwegian bedfellows were snoring like threshing-machines, trolley-cars, boiler-shops, and batteries of artillery. Then, generally without much loss of time, I suppose I joined in the chorus. All these and countless other annoyances are small matters when once you get accustomed to them and as long as one is in full possession of his health and strength. But I cannot conscientiously recommend an Arctic tent as a hospital, nor a dog-sledge in rough ice and bad weather as an ambulance. Originally published in McClure’s Magazine in March of 1900.